This article is about protective equipment. For shoulder pads in fashion, see Shoulder pads (fashion). Shoulder pads are a piece of protective equipment used in many contact sports such as American football, Canadian football, lacrosse and hockey. Most modern shoulder pads consist of a shock absorbing foam material with a hard plastic outer covering. The pieces are usually secured by rivets or strings that the user can tie to adjust the size. Allegedly Pop Warner first had his players wear them. When he was coaching at the Carlisle Indian Industrial School, he was the first one to use pads made of fiber rather than cotton. Properly fitting pads are critical. Shoulder pads are fitted to an adult football player by measuring across the player's back from shoulder blade to shoulder blade with a soft cloth tape measure and then adding 1⁄2 inch. All points of the pads should be checked to assure proper fit. Maintenance during football season includes monthly checks and replacing worn parts. 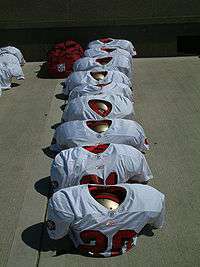 Various styles of shoulder pads exist for different positions played. 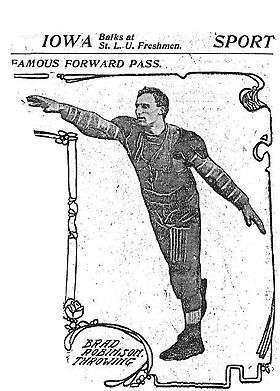 Pads for a quarterback are lightweight and offer freedom of movement. Pads for linemen are designed with few flaps and epaulets, thus reducing the opportunity of being grabbed by the opposition. A player may have a preference for vinyl buckles or elastic straps. A related piece of protective equipment is the rib protector. It attaches to the shoulder pads and wraps around the player's midsection. It is designed to protect the ribs, stomach, and back areas. ↑ "The History of Football - n/a - Google Books". 2016-02-23. Archived from the original on February 23, 2016. Retrieved 2016-02-23. Powers, Francis J. (1969). Life Story of Glen S. (Pop) Warner, Gridiron's Greatest Strategist. Chicago, IL: The Athletic Institute.